Please confirm your vehicle information in the above compatibility section. For international customers, please confirm your vehicle&###x2019;s year, make, model and VIN by sending us a message to ensure the fitment of the part since there may be a slight variations on international models. (ALL WARRANTIES MUST HAVE&###xA0;PROOF OF PURCHACE). 96-00 Honda Civic EX Delsol 1.6L VTEC Engine Rebuild Kit D16Y8. 96 - 00 HONDA CIVIC EX / DEL SOL Si. 1.6L SOHC 16V VTEC D16Y8. BRAND NEW ENGINE REBUILD KIT. 96-00 HONDA CIVIC EX 1.6L SOHC 16V VTEC D16Y8. 96-97 HONDA DEL SOL Si 1.6L SOHC 16V VTEC D16Y8. PISTONS WITH COMPLETE RING SET. ENGINE ROD BEARINGS, MAIN BEARINGS, THRUST WASHERS. Please specify the sizes of the pistons/rings and bearings you need; pistons/rings are available in standard size. Rod bearings and main bearings are available in standard size. THE TEAM ARE HAPPY TO HELP. &###x200B;&###x200B;&###x200B;&###x200B;&###x200B;&###x200B;&##x200B. &###x200B;&###x200B;&###x200B;&###x200B;&###x200B;&###x200B;&###x200B;&###x200B;&###x200B;&###x200B;&###x200B;&###x200B;&###x200B;&##x200B. &###x200B;&###x200B;&###x200B;&###x200B;&###x200B;&###x200B;&###x200B;&###x200B;&###x200B;&###x200B;&##x200B. You need to have return authorization by contacting us prior to your return. The above limitations may not be applicable in your states. The procedure for a proper A/C Service must include. Clean A/C system with an approved flush, using an approved flushing method. (R141b and Dura Flush are approved). Proof of replaced filter drier or accumulator. Proof of replaced orifice tube or liquid line that contains orifice tube. Inspection/replacement of thermostatic expansion valve & clean inlet screen. Check for proper air flow through cooling fins of condenser & radiator. Condenser may need to be replaced. Please ask your technician for details. Must add correct type & amount of refrigerant oil. After hose assemblies are attached, turn compressor shaft (not just the clutch pulley) a minimum of 10 times to clear oil from compressor (a spanner wrench may be required). Check compressor clutch electrical circuit for proper voltage. Evacuate entire A/C system for a minimum of 45 minutes if the temperature is above 80 degrees (60 minutes for dual air system or if temperature in below 80 degrees). 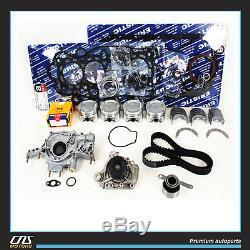 The item "96-00 Honda Civic EX Delsol 1.6L VTEC Engine Rebuild Kit D16Y8" is in sale since Tuesday, April 12, 2011. This item is in the category "eBay Motors\Parts & Accessories\Car & Truck Parts\Engines & Components\Other". The seller is "cnsmotors" and is located in South El Monte, California. This item can be shipped to United States, Canada, United Kingdom, Denmark, Romania, Slovakia, Bulgaria, Czech republic, Finland, Hungary, Latvia, Lithuania, Malta, Estonia, Australia, Greece, Portugal, Cyprus, Slovenia, Japan, Sweden, South Korea, Indonesia, Taiwan, South africa, Thailand, Belgium, France, Hong Kong, Ireland, Netherlands, Poland, Spain, Italy, Germany, Austria, Israel, Mexico, New Zealand, Singapore, Switzerland, Norway, Saudi arabia, Ukraine, United arab emirates, Qatar, Kuwait, Bahrain, Croatia, Malaysia, Brazil, Chile, Colombia, Costa rica, Panama, Trinidad and tobago, Guatemala, Honduras, Jamaica, Bahamas, Viet nam.